Week 2 of my “Small Changes” no-diet approach to weight loss is tackling ways in which we can tweak our home-based meals in little ways that really add up. 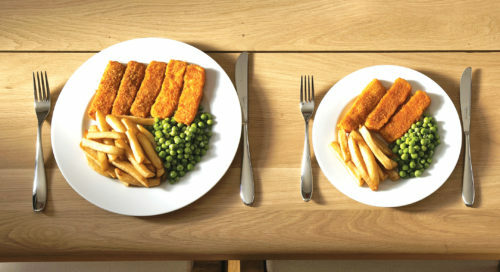 To minimize overeating, use smaller plates. This might sound silly, but it really works. So instead of using your large 10-12-inch diameter dinner plate, switch to a 9-inch salad plate. You’ll eat less but still be satisfied. Don’t eat anything directly out of the bag or box it came in. Place the food in a bowl or plate and put the bag or box back in the pantry. You’ll be more aware of how much you’re eating and force yourself to more thoughtfully make the choice about having more. Surprisingly, baby bowls work really well for snack foods like chips, crackers, nuts, etc and are a perfect size for portion control. If you’re preparing and cooking something you’ll get multiple meals out of, like a casserole or crock-pot meal, divide it all into individual portions (to be put into the fridge or freezer after cooling down) before you sit down with your meal. That forces you to be more mindful about getting up for seconds. You could also try baking casseroles in individual dishes when possible. Follow the “rule of one.” Have only one helping of each food group (the exception being vegetables prepared without excessive sauces or fats). Look out for added sugars (extra calories) and salts (that could trigger less healthy choices) in packaged foods. Frozen foods, salad dressings, sauces, and breads can have surprising sugar and salt levels. Also consider skipping sweeteners for your oatmeals, and cereals and yogurt, then add fresh fruit to sweeten.